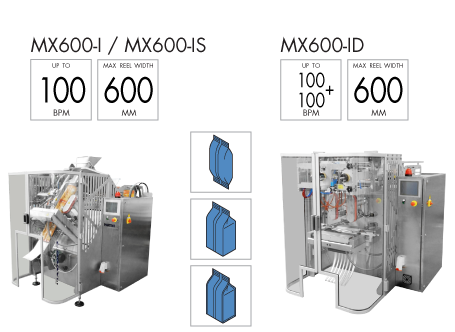 MX600-I Series - TARGET Packaging System LTD. Fully customizable thanks to an extensive range of accessories, MX600 sums up the experience of Martini srl in a model fully adaptable to the use of many different types of products and a variety of packages. We will provide you the perfect equipment for an optimized packaging process based on a thorough analysis of your production needs. Suitable for the use of heat-sealable ﬁlm reels, lap seal or ﬁn seal. Pneumatically driven vertical sealing units. Pneumatically driven or motorized horizontal sealing units.